Manganese is an essential trace mineral that promotes bone and joint health. It works by utilizing enzymes containing manganese to promote healthy cartilage production. Manganese also supports nerves and works alongside super oxide dismutase to function as an antioxidant in cells. 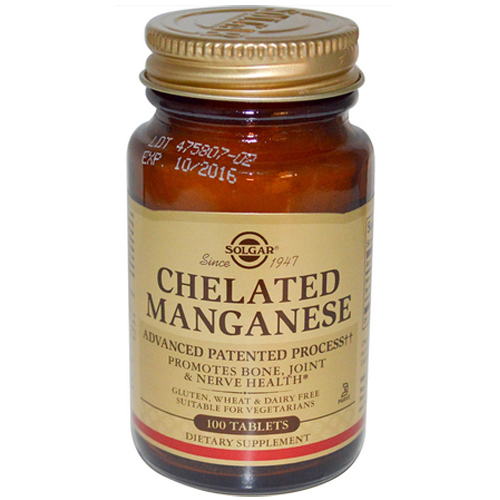 Solgar Chelated Manganese provides an advance patented form of this important mineral. Solgar Chelated Manganese is gluten, wheat and dairy free, kosher parve and suitable for vegetarians. Free from gluten, wheat, dairy, soy, yeast, sugar, sodium, artificial flavour, sweetener, preservatives and colour.